Valve has been criticized a lot over ranking system in CS:GO, which still accordingly isn’t yet cleared off with doubts. The way ranking system works, how do you rank-up, get de-ranked and how does the system filters your rank changes accordingly in Match-Making system. 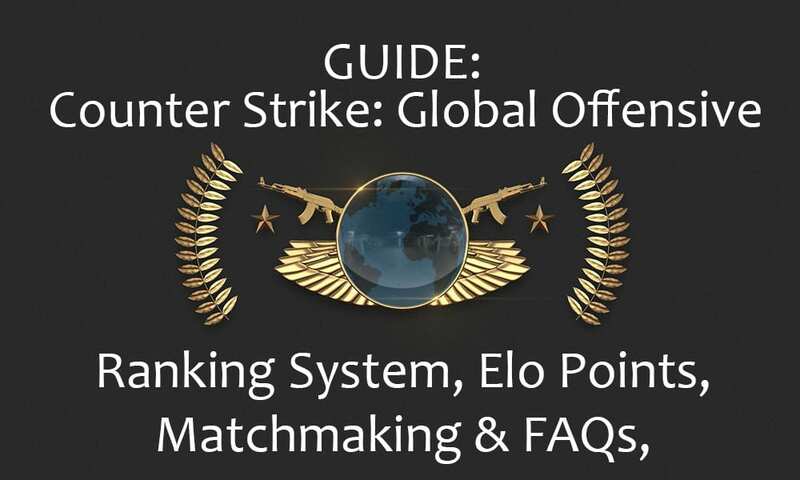 In this guide below, I’ll truly by means will try to make you people understand on how Counter Strike: Global Offensive: Ranking System works. 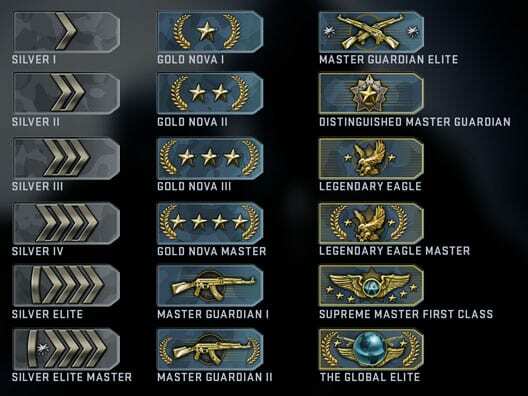 To be very honest, I was earlier myself confused over how these ranking system works in CS:GO, being a Counter Strike: 1.6 player for more than a decade, it was quite hard to adapt that Professionalism in CS:GO was determined by ranks and not by gameplay and vice-versa, if you are really good at the game, why would your rank be at diminished state? This, kind of viciously getting revolve around. In this aide, I will attempt my best to clarify how positioning functions in CSGO and what you require to build your rank. Remember that all that I portray is focused around my individual involvement with incalculable alt accounts and smurfs; as it were I don’t have any official reference for my cases, which is a bit different, as I had CS:GO since the very begining for review purposes but I started to play it regularly after couple of years, so the account was on held to a good friend who is Counter Strike: Global Offensive professional player.Neednot to mention the Pro player thing, but it really changed the way I should have understood the ranking system, as I played my first Match-making with ‘Distinguished Master Gurdian’. Okay, okay, not much into what happend and what not. Lets explore a bit of more on how actually the Ranking system works. Each Ranks covers an apparently extensive variety of Elo Points. Case in point, 2 players with the same Rank might not have the same units of Elo Points. A player near to advancement would clearly have more Elo Points than one near to downgrade, despite the fact that both have the same Skill Group (Rank). An aptitude gathering is more like a tag on a certain scope of Elo Points. One other thing worth specifying is the way that the Elo Point reach considered for choosing a player’s Skill Group is NOT relative. What this sentence means is that for instance if players with Elo Rating of 1000-1500 are viewed as MGE, when a player with 1450 Points picks up 51 more focuses, he will development to DMG however he WILL get downgraded once again to MGE in the event that he loses literally the same 51 focuses in the following recreations. I clarified this on the grounds that an alternate aide guaranteed that the apparently slider utilized for choosing positions gets “reset” on every advancement and/or downgrade which I accept is false. The reason its uncommon to derank on a misfortune instantly in the wake of picking up a rank is on the grounds that its unrealistic to lose enough indicates cause it NOT on account of the focuses are reset. MVP does NOT produce Elo Points out of slender air, it just concedes a bigger offer of the won focuses. In the event that the player with most Elo Points scores the MVP, he will might get a greater number of focuses than alternate players on the grounds that everything relies on upon the setup of the group and the amount of focuses every player has. In any case as a rule, scoring a MVP will have an enormous effect on the amount of focuses a player gets for a Round Win. In a specific end goal to accomplish a higher rank after position matches, you must win the early matches. For example, winning the initial 3 matches in a row and getting the 10 wins with 4 aggregate loses will provide for you a higher rank than losing the initial 3 matches in column and getting the 10 wins with 4 aggregate loses. Here’s an illustration, when a Silver IV solo lines, he will dependably find matches with close expertise aggregates on both sides (cordial and foes). A Silver IV can NEVER be matched even against a solitary Mg2 on the foe group. Notwithstanding, in the event that he lines with an Eagle it will be conceivable. When you’re in position matches, this farthest point is fundamentally evacuated and you will be coercively matched with individuals of significantly higher/lower rank on both sides and therefore increase/lose considerably more Elo Points. After you get 10 wins, you will demonstrate your expertise gathering and whatever is left of the matches will be played out ordinarily. There are two and ONLY two factors that can affect a player’s Elo Points (either gain or loss). The first and foremost is Round Win/Loss; You and other players on your Team will always lose points if a round is Lost. How much point each player loses depends on how much points they had in the beginning. A player with more points would lose more than a player with less points in case a round is lost. It is impossible to gain Elo Points on Round Loss and lose Elo Points on Round Win. The second important factor is MVP; The player with most MVP will most likely gain more Elo Points than others. It’s yet controversial in the observation of the mass community, however, if you have read the explanation of Elo points above, you are likely to be lighter head now. But for the readers who are still unclear, we still have a point to discuss. Elo Points are directly in proportion to Ranks. For instance, if you are winning rounds and matches with certainity and you are playing average, likely chances are you get more Elo points. More Elo points means you get the much closer to upgrade, even if you loose a match but you have played extra-ordinarily well, chances are you get more Elo Points. And as stated above, MVP’s also lead you to get more Elo’s. Similarly, the inverse side of the Rank System works pretty much well. The Uprade system will have the exact methodology with inverse after-affects, which accumulates the losses of rounds and not the whole map. A tied match or a draw would not have any noteworthy or unique contrast contrasted with a win or misfortune on the grounds that its all focused around Round results. Both an advancement and downgrade is extremely conceivable when a Draw happens. In the event that each of the 10 players surrender before the amusement begins, no focuses with be exchanged. A player who leaves a match will keep any progressions to his Elo Points until the focuses round he takes off. Case in point if a player loses the initial 3 Rounds of the match and fury stops, he will just lose the focuses for those 3 rounds and how his Team performs a while later won’t influence that single person whatsoever. Same is connected in the event that he wins a few adjusts and detaches for any reason. The completed diversion will at present appear as misfortune ever, the additional rounds won or lost at all have no impact on his Elo Points. The effect of Kick is the same as a standard leave, the primary qualification it that it won’t open the decision to Vote Surrender. So if a Team votes off an individual player, they will simply lose the inclination of keeping their current concentrates through a surrender. There are numerous cases of Ranking-Up on a Game Loss and Deranking on a Game Win, some are with screenshots and/or even features. So one may inquire as to whether its conceivable. Scientifically talking, it is conceivable to derank on Game Win and/or rank-up on a Game Loss which is greatly unlikely and uncommon.In view of how Elo Rating functions in CSGO, it is feasible for an individual player to speculatively pick up enough focuses through Round Wins so as to disregard all the misfortune and development to the following Skill Group. In any case, the expertise bunch contrast must be extremely inconceivable (i.e. he must be matched against players of higher expertise assembles on adversary group and players of lower or same ability aggregate on agreeable group) and he likewise needs to score most or possibly the majority of the Mvps. All things considered, if his group loses nearly (14:16 i.e.) and he is VERY near to propelling to the following Skill Group, he may have the capacity to get advanced. If its not too much trouble remember that it is just difficult to addition focuses on ROUND Loss, however it is numerically conceivable to win enough adjusts to increase focuses while even now losing the Best-of-30 Round diversion. Nonetheless, I am unsure on the off chance that its as of now conceivable after the late matchmaking changes and upgrades. The exact opposite can also be true, one player might be able to lose enough points to derank even if he wins a 30 round game. Obverse categories, Smurfs belong to the category of the High-skilled players (Not ranks) playing with Low-level accounts to let them help leveling them up or playing on Low-level accounts to boost them up. For Instance, a player of MG2 or above playing with Silvers on the same lobby might help the Silver to rank-up delicately and pretty quickly. The other side of the story, Boosters (I dont like them personally), are sort of leechers who desire to get their ranks boosted without struggling or investing time and skills. They choose the path of ‘Hackers’ by getting to play with them and win some matches to rank-up. My colleague won 10 games and they are MG1, I won 50 I am still Gold Nova II. Why? Basically, the more wins you have the harder it will be for you to Gain/Lose Elo Points. In other words, your rank gets closer to your true skill as you play more and more games. A player with 20 wins is able to rank-up and/or de-rank A LOT faster than one with +100 wins because of this. Please bear in mind that it both affects gaining AND losing Elo Points, so even though you might rank-up slower if you win, you also de-rank slower if you lose. I am a Silver Elite Master and have won 20+ games, Still no rank upgrade? There has been a lot of controversy circling around what’s known as Elo Hell. What is Elo Hell? It’s basically the idea that you can be stuck in a lower Rank (usually Silver-spectrum) and have a really hard time climbing up even though your true skill is a lot better. In other words, you can be stuck in Silver for a very long time while winning and top-fragging most of your games without ranking up.